SOUTH Burnett students with a passion for agriculture have new tertiary learning options just two hours away. The University of Southern Queensland (USQ) is bringing forward new course opportunities for 2019, including agricultural studies. USQ vice-chancellor Professor Geraldine Mackenzie said the university was aiming to "become more" in 2019. "USQ has a strong history of delivering industry-relevant educational programs," she said. "This year we will have even more great degree programs for students to choose from, more exciting research to make new discoveries, and more partnerships with the community to help business and industry." 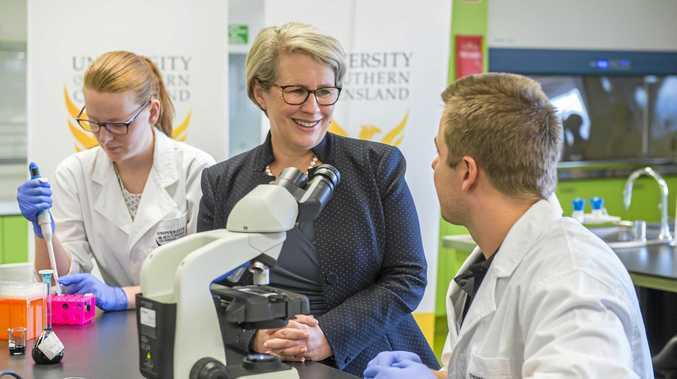 With this aim, USQ has announced it will launch an Agricultural Science and Engineering Precinct early this year. According to USQ, the ASEP will help complement current USQ research into crop production, harvesting and yield outputs. This will all aid farmers by providing them with precise information for improved crop returns on their farming methods. "This will support our world-class agricultural and environmental science research, so that we remain a national leader in cropping and biotechnology research," Professor Mackenzie said. "This will help farmers with more accurate information for improved cropping." For South Burnett residents who might not want to relocate to Toowoomba, USQ also has many online options for their courses. "We are introducing a range of flexible business programs, so that you can dip in and out of study, whether it's a mini course or a full degree," Prof Mackenzie said.